Ntukogu,a facebook user shared this report. order to respect the leader. Clement did not reveal the name of the church. up; I myself also am a man"
0 Response to "Unbelievable! 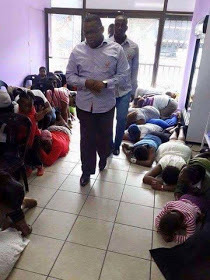 See Photos Of Church Members Lying On The Floor As Their Pastor Is Coming"